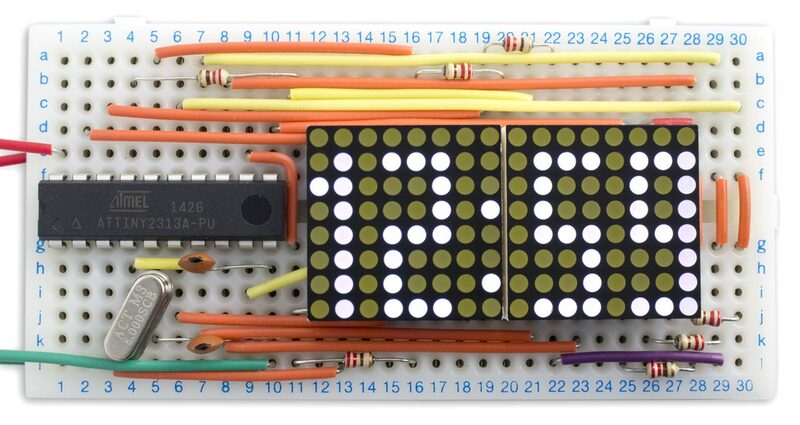 Dot matrix clock based on an ATtiny2313. I wanted to design myself a clock that was a bit more individual than one using a standard 7-segment display, so I decided to try basing one on a pair of 8x8 dot matrix LED displays. These are available fairly cheaply from a number of sources. I chose a pair of 0.8" 8x8 LED matrix displays from Adafruit . They are available in a range of different colours, but I chose white because they tend to be the brightest, and this would enable me to minimise the current consumption. Adafruit recommend driving the displays using a 74HC595 and TPIC6B595, or a single MAX7219. However, I think it's usually cheaper to drive displays directly from a processor, and it also generally makes the wiring simpler. I therefore set about finding the smallest AVR processor that would drive the displays with the information I needed to show. In addition, we can save some I/O lines by using the same I/O line for a row and a column if we never need to light the LED at their intersection, as shown by the light grey squares above. Using all these savings allows us to drive the clock displays with just 14 I/O lines, labelled B0 to B7 and D1 to D6 in the above diagram. The ATtiny2313 provides 17 I/O lines, so that conveniently leaves the two we need for the crystal, and one for a push button to set the time. Note that Columns is used for the colon, and Columns to Columns for the 11 digit columns. The value in compare register OCR1B determines how long the digit is on for, and can be used to adjust the brightness of the display. I set it to 480, which gives the dimmest possible display, to save battery power. At this brightness the current consumption of the clock is about 10mA. You could also use the OCR1B value to adjust the brightness of the display, such as to dim the whole display at night. It reads the dot definitions for the next column, from the appropriate digit and digit column. If the leftmost digit is a zero, it replaces it with a space to blank the leading zero. It then writes the dot definitions to PORTB, and configures the lit dots as outputs. It counts down from 2000 to give 1Hz from the interrupt. It then increments the values in Buffer, using the values in the corresponding elements of Size to specify when to carry to the next digit. The variable ColonState is used to flash the colon at 1Hz. 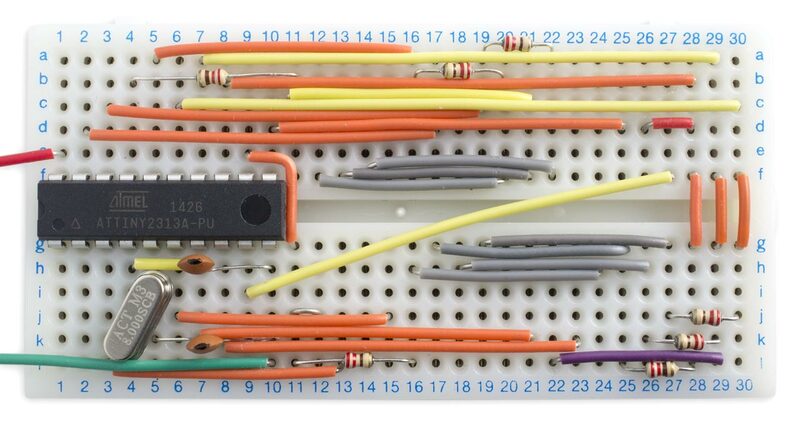 Circuit for the ATtiny2313-based dot matrix clock. The seven rows of the dot matrix displays are connected to the corresponding pins of port B via 220Ω resistors, to limit the current. At full brightness, with OCR1B set to 0, the total current consumption is about 25mA, well within the ATtiny2313's maximum rating of 60mA. With the display dimmed by setting OCR1B to 480 the current is reduced to 10mA, but the display is still quite visible. I powered the clock from a 3.7V rechargable LIPO battery. Interconnections under the dot matrix displays. The circuit fits neatly on a small solderless breadboard I bought from Bright Components on eBay . Connecting the Tiny AVR Programmer to the ATtiny2313. This adds an ATtiny2313 @ 8 MHz (external crystal; BOD disabled) option to the Board submenu. Select this, and choose Burn Bootloader to program the ATtiny2313 fuses for an 8MHz external crystal. 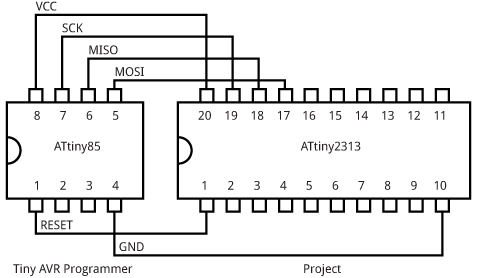 Then upload the program to the ATtiny2313. Here's the whole program for the Dot Matrix Clock: Dot Matrix Clock Program. Or, design your own font! ^ Miniature Ultra-Bright 8x8 White LED Matrix on Adafruit. ^ Solderless Prototype Breadboard (360 Points) from Bright Components on eBay.